Before the days of clipping coupons and scanning quick response (QR) codes, the early day merchants employed their own means of making their wares more enticing to customers. One such tactic many found useful was the distribution of trade tokens. Of varying qualities of metals, trade tokens could be given to potential customers as a means of luring them in your business for the first time or could be given to seasoned customers as a way of thanking them for their patronage. Yet, another indirect purpose they served was as a means of advertising. Some places of business used varying sizes of tokens to represent their associated trade-in value. 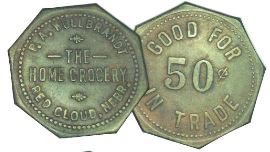 A myriad of merchants from grocers to saloon keepers found trade tokens a useful advertising tool. Long since having a utilitarian need, trade tokens, though somewhat illusive, have become popular items for collectors. 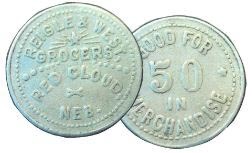 Pictured are a few trade tokens that represent some of Red Cloud’s historic businesses. These are from the John A Yost and Suzi Yost Schulz collections.